Smaller groups traveling short distances will love one of the smallest minibus available. This compact vehicle acts as the perfect shuttle for weddings, corporate events, and nights out in town. When you book with Boston Charter Bus Company, you’ll book a bus with a professional, experienced driver who will handle everything for you. Whether you need a bus for a corporate convention, wedding, school event, sports team, or more, you’ll be in good hands with us! Call today at 617-314-7577 for a free, no-obligation quote. Our reservation specialists are available 24/7 for your convenience. The 25-passenger minibus helps to transport medium-sized groups who are too large to separate into multiple cars but too small for a full-sized bus. Load your friends onto your own minibus and explore Boston with a professional driver by your side. Craft your own itinerary and leave the navigation to us! 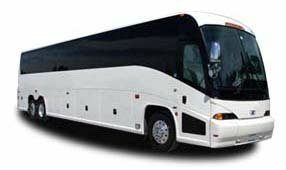 Book a full-sized 56-passenger charter bus to comfortably accommodate every member of your large traveling group. Outfitted with amenities such as plush reclining seats, panoramic windows, and an on-board toilet (available upon request), this model is ideal for long-distance journeys to and from Boston. 18-passenger minibuses are perfect for shuttling small groups of travelers around Boston. Use this model as a hotel shuttle at your corporate event or as an efficient way to transport wedding guests between your hotel and your venue. Zip through Boston with ease while a professional handles the driving. Travel through Boston with a 20-passenger minibus for an easy and stress-free trip. Comfortable seating and on-board entertainment options make this bus a great choice for traveling groups with small children. Everyone can stay comfortable while an experienced driver transports you to every stop on your Boston itinerary.